What changes will make the 2020 Nissan Rogue different? Maybe a new option package or two to celebrate what’s been a remarkable run for this compact crossover SUV. An all-new — and likely radically different — Rogue is in the works for model-year 2021 or ’22. That leaves the current generation, introduced for model-year 2014 and refreshed for ‘17, deep into its sunset years and hardly apt to change much. It’ll continue for 2020 as a four-door five-seater available with two powertrains — one a modestly powerful four-cylinder, the other a gas-electric hybrid – and a choice of front-wheel drive or all-wheel drive (AWD). The Rogue slots into Nissan’s crossover lineup between the subcompact Rogue Sport and the midsize, five-passenger Murano. For 2020, Nissan could well group popular features to create one or more special-edition packages – it added two for model-year 2019 alone. Otherwise, expect the ‘20 Rogue to continue the formula that’s made it the Japanese brand’s top-selling vehicle and a contender for No. 1 overall in the wildly popular compact-crossover segment. Indeed, Rogue sales increased nearly 7 percent through the first three quarters of 2018, quite impressive for a vehicle so deep into its lifecycle. Granted, Nissan includes the smaller Rogue Sport in Rogue’s sales tally. The added numbers account for a fraction of Rogue’s total. But even without them, this crossover trails only the Toyota RAV4 in class sales and ranks ahead of such segment stalwarts as the Honda CR-V, Chevrolet Equinox, and Ford Escape. Nissan hopes to sustain that success with the next-generation Rogue, previewed in large measure by the automaker’s Xmotion concept crossover. Pronounced “cross motion,” the Xmotion hints at a far more rugged-looking Rogue, today’s soft contours replaced by chunkier forms and aggressively sculpted nose and tail. The concept’s proportions create a more muscular stance, too. Its wheelbase (the distance between the front and rear axles) is 3.4 inches longer than today’s Rogue but its body 3.2 inches shorter bumper-to-bumper. Xmotion’s futuristic cabin design would be toned down for production, but its generous wheelbase accommodates a small third row of seats, something the current Rogue offered until model year 2018. Should I wait for the 2020 model or buy a 2019 instead? 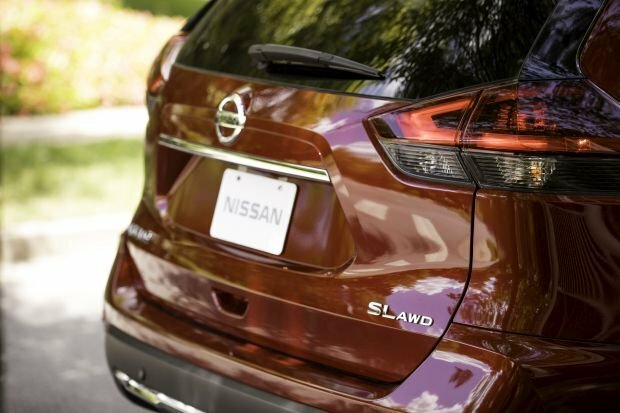 Wait for the ’20 if you want to capitalize on Nissan’s efforts to keep this crossover appealing until the next-generation replacement arrives. That doesn’t portend meaningful styling changes, although a new exterior color choice or two is possible. More likely are additional packages that group popular features at attractive prices. For 2019, Nissan added the Special Edition Package that enhanced Rogue’s base S trim and the Premium Package that equipped the middle-grade SV model with the ProPilot Assist semi-autonomous driving system. That was on top of model-year-2018 changes that made autonomous emergency braking and blind-spot and rear-cross-traffic alerts standard across the line and introduced ProPilot as an option exclusive to the top-line SL grade. The ’20 Rogue will almost certainly return the S, SV, and SL as its three core models, with the SV and SL again available as hybrids, as well. All will be essentially unaltered from their 2019 counterparts. That’s no bad thing to the many folks who find the current Rogue appealing for its handsome styling, roomy and comfortable cabin, wide range of available amenities, and competitive pricing underpinned by frequent factory incentives. That neither the gas-only nor hybrid versions furnish anything more than merely adequate acceleration doesn’t seem much of a deal-breaker. Indeed, Nissan wisely bolstered Rogue’s value proposition for model-year 2019, adding not only the new S and SV packages, but making ProPilot standard on the SL and enhancing safety by equipping every grade with lane-maintaining safety technology and automatic highbeam headlamps. Those features will carry over for 2020, and while Nissan has kept price increases pleasantly modest over the past couple of years, it’s still likely to charge more for the 2020 Rogue. So you’d be asked to pay more for a crossover that’ll look like the ’19 version, and perform like it, too. The ’20 will also be a year closer to seeming dated against the redesigned Rogue. Whether that next-generation version bows for model-year 2021 or ’22, buying a 2019 Rogue gives you an added season with your crossover before the curtain falls. Only if Nissan introduces new appearance packages – something like the popular black-trimmed Midnight Edition of a couple years ago — or even a specialty model, such as the Star Wars-themed Rogue One of a few seasons back. It also could cobble together a new flagship, perhaps by expanding on the impressive Platinum Reserve Interior option that gilds the SL’s standard leather upholstery with premium tan hides and quilted inserts. But Rogue’s shape, dimensions, and basic look won’t change for 2020. All models will continue with LED daytime running lamps, with visual differentiators again running to items like wheels: 17-inch standard steel or optional alloy rims for the S, 17-inch alloys or 18s optional for the SV, and 19-inch alloys standard for the SL. Expect details like rear privacy glass, chrome door handles, and LED integrated turn-signal mirrors to remain optional on S and standard on SV and SL. Remaining a 2020 Rogue selling point will be its smartly packaged cabin. Few shoppers likely pined the loss of the seldom-ordered third-row seat option; it was toddler-sized and its discontinuation leaves the Mitsubishi Outlander and Volkswagen Tiguan, with their similarly puny third rows, as the only compact crossovers with seating for more than five. The ’20 Rogue will again provide uncommonly comfortable accommodations, with the sliding and reclining rear bench notable for its theater-seating elevation. The dashboard is attractive and easy to use, although all models are saddled with a 7-inch touchscreen too small to optimally display navigation maps. At 39.3 cubic feet behind the rear seat, and 70 with it folded, cargo volume on gas-only models is at the upper end of the competitive set. 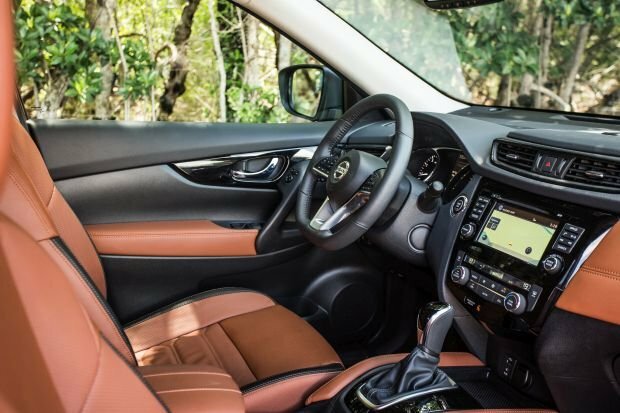 Versatility is enhanced by Nissan’s nifty Divide-N-Hide panels that compartmentalize the luggage bay; it should remain standard on every 2020 gas-only Rogue. Room taken by the battery back reduces the Hybrid’s volume to 27.3 and 61.4 cubic feet, respectively. And it isn’t available with Divide-N-Hide. Sadly, that possibility has almost surely passed for this generation Rogue. Most 2020 buyers will continue to choose the gas-only engine, a 2.5-liter four-cylinder that should return with 170 horsepower and 175 pound-feet of torque. That’s scarcely midpack for the class. While acceptable in gentle around-town driving, acceleration is lackluster from a stop and there’s little in reserve for merging onto a busy freeway or passing fast-moving traffic. The 2020 Rogue Hybrid will again be available only in selected Western, Northwestern, Mountain, and Mid-Atlantic markets. It represents less than 10 percent of Rogue sales — and is no more rewarding to drive than the gas-only version. It uses a 2.0-liter four-cylinder assisted by an electric motor. Net output should remain 176 horsepower (Nissan doesn’t specify a torque figure). Saddled with 200 additional pounds of lithium-ion battery pack and associated hybrid hardware, Hybrid-model acceleration won’t be a notable improvement over the gas-only Rogue. Part of the blame for Rogue’s disappointing powertrain behavior rests with the continuously variable transmission used by all models. A CVT performs the duties of a conventional automatic transmission but without stepped gear ratios. In this application, the CVT suffers sluggish response to throttle inputs, a fault made more annoying by its tendency to let the engine to drone intrusively as vehicle speed climbs. Flipping to the driver-selected Sport mode helps some. But we’d urge Nissan to somehow recalibrate this CVT to improve its behavior. Better yet would be addition of a turbocharged engine, perhaps the 1.6-liter four available in the Nissan Sentra compact sedan (188 horsepower, 177 pound-feet of torque), or even a version of the 248-horse 2.0-liter from the Altima midsize sedan. Alas, it appears an upgrade of that magnitude will have to await the next-generation Rogue. Happily, the current Rogue compensates for its second-rate powertrain with first-rate road manners. The CR-V, Escape, and CX-5 should continue among the segment’s handling champs. But the 2020 Rogue should again deliver a praiseworthy if conservative blend of composure and consistency. Ride comfort will remain a hallmark, as well, although the SL’s 19-inch wheels and tires transmit too much impact harshness and road noise to the cabin to make them worth any aesthetic gain. About 55 percent of 2020 Rogue buyers will again spend some $1,350 for AWD. It doesn’t make the Rogue an off-road warrior, despite a relatively generous 8.4 inches of ground clearance. Still, we recommend it for the added dimension of slippery-surface traction it provides. Not likely. With no aerodynamic tweaks or powertrain changes in the cards, the 2020 Rogue’s EPA ratings should repeat those of 2019. That’s not troubling, given Rogue’s already laudable mileage numbers. For 2020, the gas-only Rogue should repeat at 26/33/29 mpg city/highway/combined with front-wheel drive and 25/32/27 with AWD. Likewise, the 2020 Rogue Hybrid ought to repeat at 33/35/34 mpg with front-drive and 31/34/33 with AWD. The Rogue Hybrid is not a plug-in hybrid, recharging instead by converting energy otherwise lost during braking and coasting. Gas or hybrid, any ‘20 Rogue should again be among the most fuel-efficient vehicles in this class. Nissan might juggle some items among trims or reapportion existing ones to create fresh options packages. Introduction of new features isn’t likely; Rogue already offering most every comfort and convenience item a compact-crossover buyer might desire. But Nissan could capitalize on the push upmarket in this class. It aims the Rogue Sport and the even smaller Kicks at entry-level crossover shoppers. So, with the top-of-the-line Rogue SL and its available Platinum Reserve Interior already accounting for a quarter of Rogue sales, the automaker may well decide an even more opulent trim level could find an audience – and lay the groundwork for the upscale repositioning of the next-generation model. Overall, the ’20 Rogue will continue with a commendable array of standard and optional touches that add to its strong value-per-dollar equation. Foremost will be the suite of driver assists standard on every model. These include autonomous emergency braking that can stop the crossover to mitigate a frontal collision with another vehicle or a pedestrian. Also standard will be blind-spot and rear cross-traffic alerts, enhanced on SV and SL models by automatic rear braking. Every ’20 Rogue will come with lane-departure warning and Nissan’s Intelligent Lane Intervention, which mimics the attributes of automatic steering correction by applying brakes to slow your transition out of your lane. Expect adaptive cruise control that can maintain a set distance from traffic ahead to remain standard on the SL and optional on the SV as part of the Premium package. Same goes for ProPilot Assist, which Nissan touts as a “hands-on driver assistance system for use on highways.” We recommend a thorough test before deciding if it’s right for you. It uses sensors to calculate the distance between lane markings and steers the Rogue automatically to keep it centered in the lane, even around curves. ProPilot’s autonomous dimension is diluted, however, because the driver must maintain a grip on the steering wheel even when it’s active. And in our testing, the automatic steering corrects with an abruptness that’s the antithesis of smooth driving. Standard equipment on all ’20 Rogues will again include remote keyless entry, second-row heating and air conditioning vents, Bluetooth connectivity, satellite radio, and iPod-compatible USB linking. A 7-inch dashboard screen for audio and basic vehicle info is also included, along with Apple CarPlay and Android Auto. Expect an imbedded navigation system to remain standard on the SL and optional for the SV as part of the Premium Package. Same for Nissan’s Around View Monitor, which projects a 360-degree view to aid close-quarters maneuvering. Every 2020 Rogue will again have a rearview camera and the SV and SL should return with remote engine start, keyless entry with pushbutton start, and dual-zone automatic climate control as standard. Expect heated front seats to again be standard on the SV and SL and, in a welcome departure for this class, optional on the bottom-rung S model as part of its Special Edition Package. On SV and SL models, expect a hands-free power liftgate to again be standard with a panoramic moonroof again included in option packages. For gas-only models with front-wheel drive, estimated 2020 base prices are $25,900 for the S, $27,400 for the SV, and $32,500 for the SL. To those prices, expect to add around $1,350 for AWD. Look for the 2020 SV Hybrid to be priced from around $28,700 and the SL Hybrid from around $32,700, with AWD another $1,350 or so. 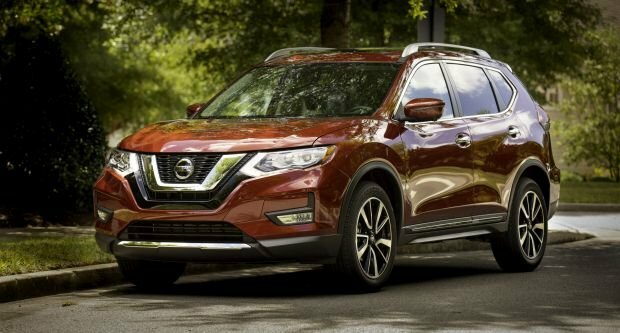 If Nissan repeats the main options groups for 2020, expect the S Special Edition Package to again cost around $800 and upgrade the base model with several features that are standard on the SV: rear privacy glass, heated mirrors, a leather-wrapped steering wheel and shift knob, heated front seats, roof rails, some chrome trim, and 17-inch alloy wheels. Similarly, the SV’s Premium Package (for 2019, $1,800, or $2,980 for the SV Hybrid) would again contain 18-inch alloy wheels and some SL features, including imbedded navigation, Around View Monitor, a heated steering wheel, memory for the driver’s seat and outside mirrors, ProPilot Assist and adaptive cruise control, and an electronic parking brake. Figure the SV Sun And Sound Touring Package to return at some $3,530 and include all the Premium Package features, plus the panoramic roof, upgraded Bose audio with nine speakers, imbedded navigation, around-view monitor, heated steering wheel, and adaptive cruise control. For the 2020 Rogue SL, expect the Platinum Package to again cost around $2,000 and include the panoramic roof and LED headlamps; and the Platinum Reserve Interior to again add around $250. Expect a fall 2019 release date for the 2020 Rogue.